This is a simple recipe, but requires a little patience to make and prepare…..but it will definitely be worth it, believe you me!! I made this for lunch as a treat, as we had ½ a butternut squash in the fridge and huge chunk of pecorino cheese, so I decided to make some pasta and whilst that was resting I roasted the squash. All the components are really easy, the tricky part is always getting your pasat thin and then making sure not to overfill the little parcels. Give it a go, and just make sure that you seal the ravioli securely so as not to let any of the yummy filling leak out. To make the pasta, tip the flour into a bowl with the salt and add the eggs. Bring the dough together until it starts to form a ball. Tip out onto the worktop and knead a little until the dough is even. Wrap in clingfilm and leave to rest in the fridge for an hour. Meanwhile, preheat the oven to gas mark6/180-200 degrees Celsius. Cut the squash into equal size chunks, leaving the skin on and place on a baking tray. Drizzle with a little olive oil and season with some salt and pepper. Roast in the oven until soft, around 45minutes depending on your oven. Leave to cool a little and then scrape the flesh into a bowl leaving the skins out. Mash with a fork until smooth but still has a little texture. Grate some fresh nutmeg in to taste and add a good grating of Pecorino or Parmesan. If you have some Ricotta, add a good tablespoon of the wonderful stuff. Taste to check the seasoning and to ensure that you can taste the nutmeg and the cheese. Put to one side to cool completely whilst you tend to the pasta. Cut the pasta dough in half and keep one half in the fridge wrapped in clingfilm. Half of the mixture will make 8 decent sized ravioli, enough for two starters or one hungry baker for lunch. Attach your pasta machine securely and set the rollers onto the fattest setting. This process will need patience, but stick to it as your pasta will be delicious. I’m no Italian Mamma, but feed the pasta through the rollers gradually, at least 4 times on each setting until you’ve reached the thinnest setting. Cut your long strip in half and place on a lightly floured surface. 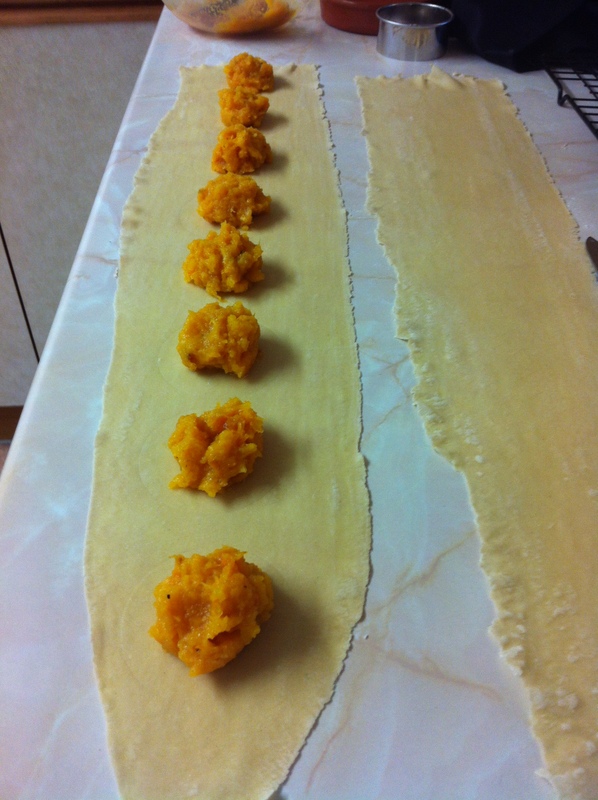 I marked out lightly with a round cutter, around 2 ½ inches wide, 8 raviolis on the pasta, then filled each one with a heaped teaspoon of the butternut squash mixture. Using water and your finger wet the edges of the ravioli and then place the other strip of pasta on top. Take your time, as you’re now really close to finishing!! Carefully, using the side of your hand, press the top strip of pasta down neatly around the filling, like as if you’re cupping them, sealing the two strips of pasta together and making sure there isn’t lots of air trapped inside. Continue down the line until all 8 are sealed. Use the same round cutter to cut out your round of pasta and carefully lift the beautiful little parcels and keep on a plate/baking sheet/anything dusted with some semolina so that they don’t stick. Bring to the boil a large saucepan of salted water and carefully put your ravioli in to cook. They take a minute at the most as they’re super fresh. Meanwhile, melt some butter with the sage leave until frothy – don’t let the butter brown. Once the pasta is cooked add it to the sage butter and let the ravioli soak up some of the butter for a few seconds before serving. Spoon the sage butter over the top of the pasta and grate a good amount of Pecorino/Parmesan on top. Eat and enjoy….see, I told you it was worth it! The end product….definitely worth the wait! ← The Great British Bake Off – Should you apply for series 5? I was recently bought a pasta machine and it’s yet to be used. I think this is the sort of recipe I would like to try. Sounds heavenly. Don’t be scared of the machine!! 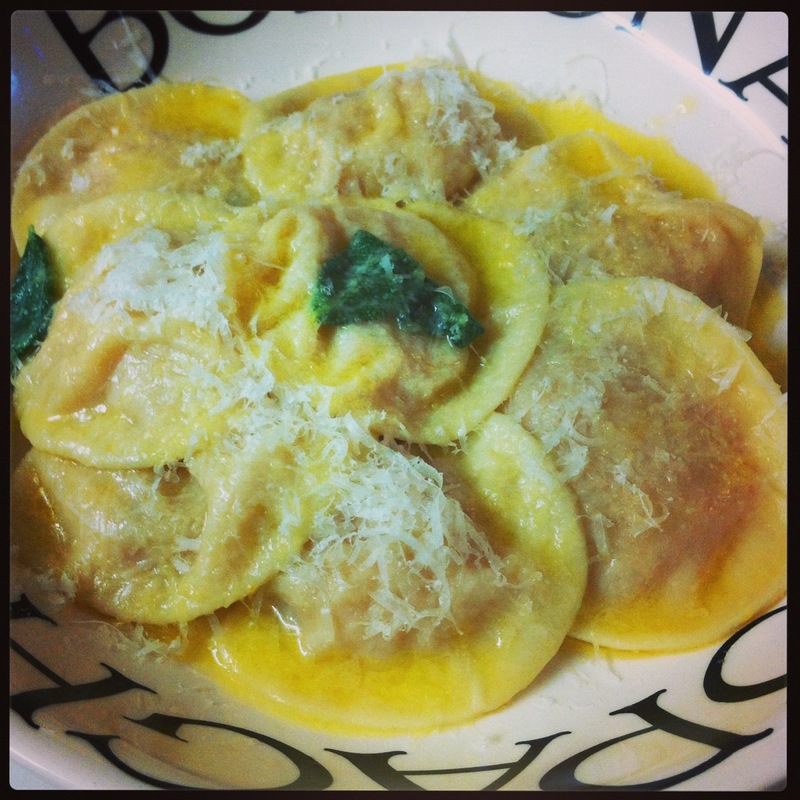 Homemade pasta is the best! I’ll definitely try it out soon.